Note to Sierra: I'm not sure you will see this recipe but I named it for you! I was really sorry to miss you at the MCC Relief Sale ... I did look for you but didn't find you! 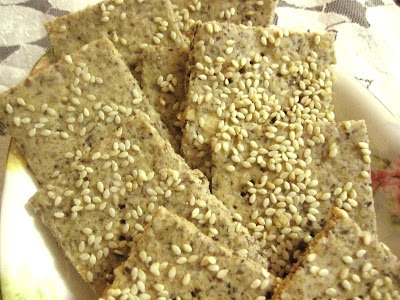 It is getting easier to buy Gluten Free products and crackers are one of the easier things to find that taste good but GF products are expensive and sometimes its just nicer to be able to make them yourself ! This cracker is quick, easy and loaded with healthy nutrients. Place ball of dough onto a piece of parchment paper , flatten dough with hands , cover with a piece of plastic wrap and roll out the dough between parchment paper and plastic wrap until quite thin -- keeping sides as rectangular as possible. Sprinkle with sesame seeds and press them down under plastic wrap. Slip parchment paper with crackers onto a cookie sheet. Let cool , then separate crackers. Enjoy plain or with cheese or desired toppings. This is comfort food for sure. so I'm always having to think up something for lunch. This hot sandwich provides a quick and welcome meal. Add sliced onion to the pan and cook over medium heat until wilted. Add mushrooms and butter and continue to cook until mushrooms and onions are browned. Add bacon pieces and sprinkle shredded cheese over top. Cut buns in half and toast lightly. Butter buns (if desired) and top with mushroom/melted cheese mixture. 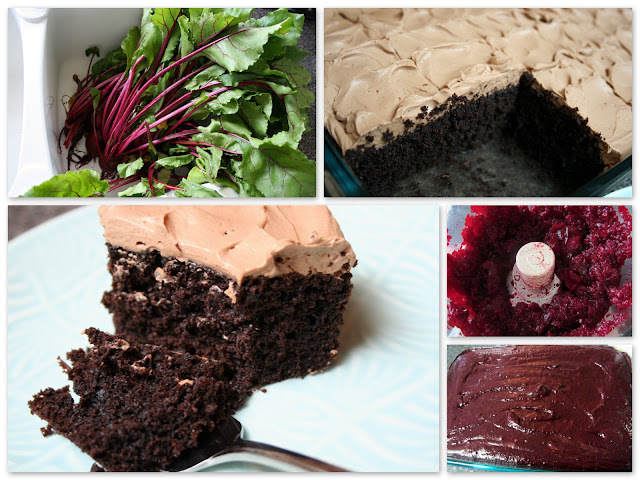 Are you wondering what to do with the last of the Beets in your garden? I made this cake for a group this last weekend and not one person could detect the Beets and the entire cake was enjoyed by all. Give it a whirl and let me know what your picky Beet eaters think. I made this cake again last night. ..making a few more changes to get the flavour and crumb just right. It is moist and it stays moist!! No beets in your garden? Try canned beets. .but not pickled!! Wash the beets well and remove all but 1 inch of the stems. Cover with water and bring to a boil and then lower heat and simmer until tender. Test the largest beet with a sharp knife. The beets test done when the knife easily slides in. Drain the beets and run under cold water and slip the skins off with your hands. Dice into large pieces and put into a food processor or blender and pulse until the beets are finely ground. If you do not have a food processor, mash with a potato masher until very finely mashed. Measure the beets to make 1 1/4 cups. In a medium bowl, sift together the flour, cocoa, instant chocolate pudding mix, baking soda, and salt. In a large bowl, using a hand mixer beat the sugar and eggs together until thick. Slowly add the oil, sour cream and beets and then the flour mixture and vanilla. Pour into a greased 9 X 13 pan and bake for about 35 minutes. Test with a toothpick. In a medium bowl, beat the whipping cream with a hand mixer until frothy. Slowly sprinkle in the instant pudding and continue to beat until thick. This is high bush cranberry season here on the prairies. 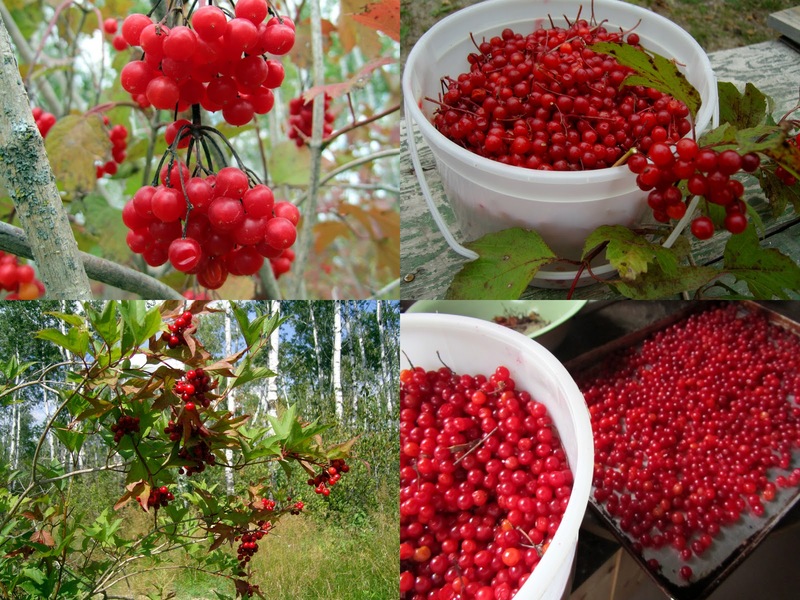 These cranberries when ripe are tart and juicy and excellent for pies or jellies. This is my favorite pie at this time of the year. It brings back memories of growing up on the farm, picking berries and Mom baking pies and freezing the rest of the berries to enjoy in winter. This pie is amazing served warm with ice cream. After your berries are picked and cleaned, head to the kitchen to make your favorite pastry. Once your pastry is made it's time to make your filling. Spoon into your unbaked pie crust, cover with a top crust, trim off excess and crimp the edges. Brush top with milk, sprinkle with sugar. (optional). Cut vents for steam to escape while baking. Bake in a 425º oven for 15 minutes, reduce heat to 375º and bake for 30 to 35 minutes longer. Serve warm with ice cream, if you are feeling generous share the pie with friends. It's tomato season...I've had a wonderful harvest and am thrilled with the results, the only thing is that I cannot keep up with them. Now that we have had our first rain, I heard that we should quickly pick all our tomatoes as to save them from getting blight. I was chatting to Lovella about my abundance in fruit and she asked me what I did with them all? I said, "You just wash them, throw them in a bag and freeze them." What? She did not believe me. 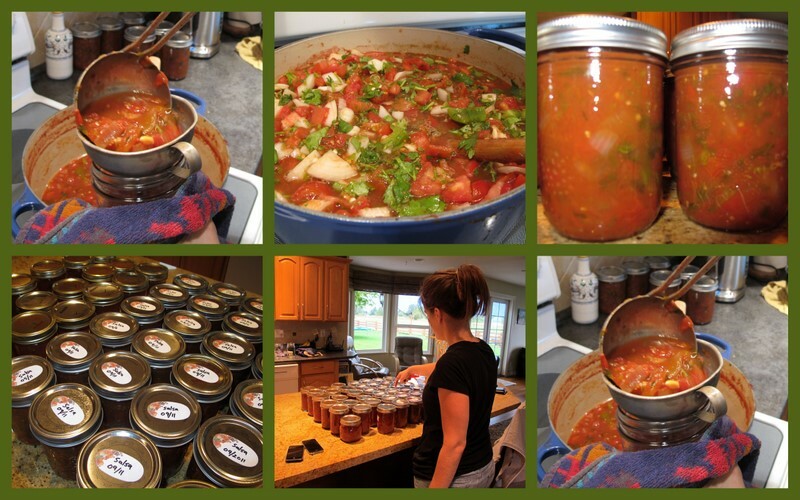 I said, "I've been doing that for years, and then in the middle of winter when I have time I use the frozen tomatoes to make my fresh chilli, salsa, soup, or spaghetti sauce." "You need to post that." says Lovella. That's a great idea. It's funny how sometimes the simple techniques that we use, need to still be shared with our wonderful readers. Now let the busy months of the year pass by and by January you will begin to remember those frozen tomatoes in your freezer. Do not thaw them as they are difficult to cut. Throw them into a sterile sink with hot water. The peels will peel off very easily. Cut them into the desired size. 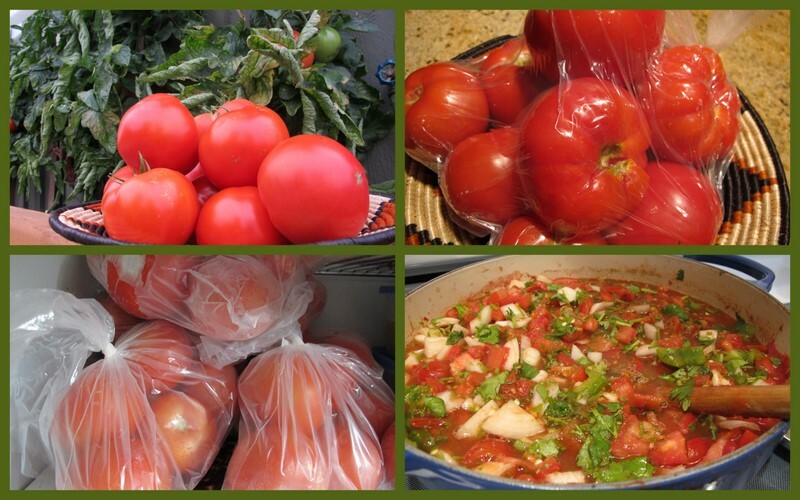 Make your favorite salsa, spaghetti, soup or chilli sauce. I entered Elsie's kitchen, (SIL) and saw these fresh peaches sitting on her counter. Then my eyes turned towards this peculiar kitchen gadget. She said, "You don't have this in your kitchen?" "Take one home right now...I have two of these." While making my salsa today...my daughter not only enjoyed this gadget, but noticed how it poured so simply into the jars. No more dripping syrup on my jars and towels. Are you still looking for a good Salsa recipe? This kitchen gadget is inserted inside your jar. I promise you..."No More Mess! And No More Burns!" Sometimes it's the simple things in life that keeps life running smoothly. I have not ventured out to see where these could be purchased...But I know you will all want one...Let's see who knows what they are, or what they are called or better yet, who has one of these? "And you must think constantly about these commandments I am giving you today. at bedtime and first thing in the morning. and write them on the door posts of your house." When I was a young parent...I remembered hearing those scripture words quoted. They have been embedded in my heart for years and years. I'm one who loves visual learning and this commandment could not of been better said. Knowing and recognizing the influence that parents can model, I too wanted to influence my children. not just those related to church and to private schools. 'One Thousand Gifts" by Ann Voskamp. and detail, the light and shadow, of all the scattered moments in life. 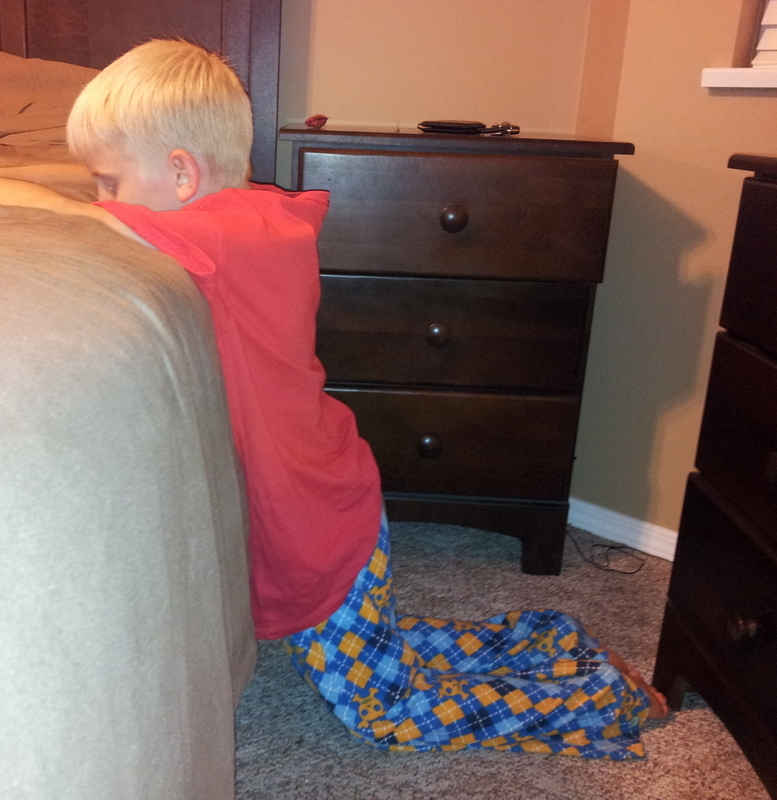 we can continue exercising the gift of prayer and thanksgiving for the next generation. to bow down quietly in reverence before their Maker. Let's encourage one another in teaching our children and grandchildren the truths. The words from the scriptures give proof that the next generation hands on the legacy of faith. join with me as we continue to see the daily blessings that God gives to us. Let's dare and encourage each other to live fully right where we are. One hundred times a day, everywhere we turn, everything we touch, everything we see. Holy One of blessing, Your presence fill the Universe. Zucchini are plentiful at this time of year...if not in your garden than at the farmers' market. Here's a new twist to an old favorite of mine...oven-baked rather than deep-fried zucchini sticks. Crisp on the outside and soft inside...they are quite addictive. Be sure to find nice young zucchinis about 9 or 10 inches long...not the ones that got too big in your garden. Preheat oven to 400°F. Line baking sheet with parchment paper...or sprayed well with cooking oil. Combine bread crumbs, Parmesan cheese, salt and oregano. Beat eggs in shallow bowl until frothy. 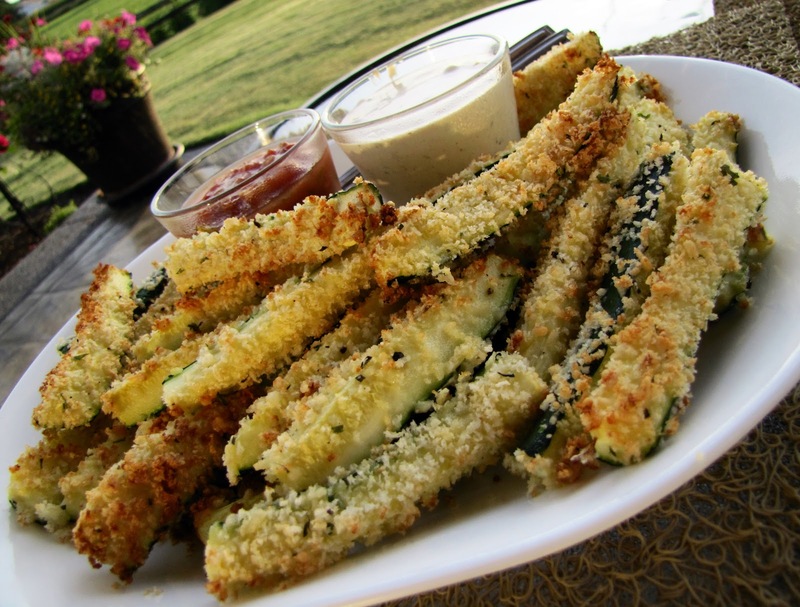 Dip zucchini sticks in egg, then coat in crumb mixture...one at a time. Bake 20 minutes or until tender crisp and golden in colour. Serve with a ranch-type dressing (we prefer jalapeno ranch) or even salsa. This Applesauce Spice Cake is a family favorite and both our daughter and my husband prefer this cake for their birthday celebrations. Pour into well greased and floured 10 inch tube or fluted tube pan. Bake in preheated oven for 50-55 minutes or until cake tester comes out clean. Cool in pan for 15 min. remove and cool on rack. When the cake has cooled and before I serve it I give it a dusting of powdered sugar. It's good by itself or served with vanilla ice cream or whipped cream. Even though summer is coming to a close, we are not done with the grill. I think I will drag that out for as long as possible. 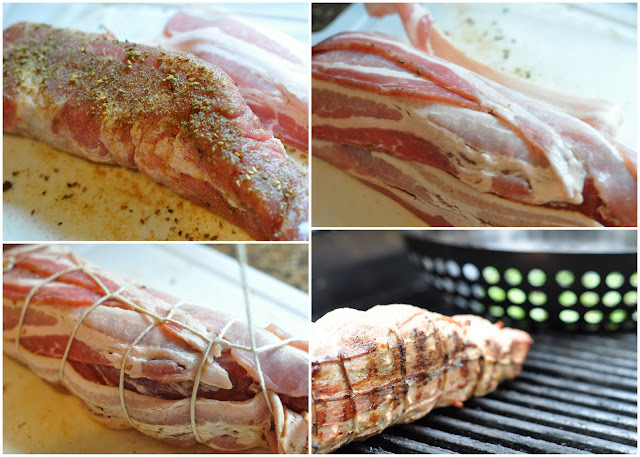 The idea of this bacon wrapped tenderloin comes from my cousin, Alvina, who hosted us while in Manitoba this summer. Alvina used seasoned pepper, garlic salt and seasoning salt. When I prepared this recently, I did not have the same spices she had, but found the recipe quite forgiving, turning out very nice with an added (thyme) herb mix from Palestine, which I got at Ten Thousand Villages at one of our signings. Sprinkle pork somewhat generously with spices. Cover, lengthwise, with slices of bacon. Cut a long piece of kitchen twine (longer than a yard or meter long), wrap and tie it around one end, holding the bacon in place. Continue wrapping with twine, looping it and and extending it another inch as you go down. Knot at the end and, if you have twine left, bring it up, around the back side and knot again. Transfer to serving dish, remove twine, and cover with aluminum wrap to sit for about 5-10 minutes before removing twine and slicing. Serves four. To complete this meal, we roasted thickly sliced yams, in the oven, seasoned with olive oil, garlic, salt and pepper as well as grilled chopped baby asparagus on the grill, seasoned with olive oil and garlic. manicotti or large shell pasta. Add a salad, and supper is ready. Cook pasta as directed on package. Do not over cook. Drain. In a non stick pan over medium heat saute garlic and peppers in olive oil for 3-4 minutes. Stir together next 7 ingredients and add peppers and garlic. Pour half the tomato sauce into a shallow casserole. Fill pasta shells with salmon filling and lay over sauce in a single layer. Pour remaining sauce over pasta, making sure the pasta is all coated. Top with mozzarella. I sit here at my kitchen table, pondering the thoughts that are crossing my mind for this "Bread for the Journey". I am reminded of the singer and songwriter Steve Bell and the great story teller he is. He told us that often he forgets words to his songs, or as he is writing, he just can't come up with just the right words, hence it becomes, nananananana, or deereetdeereetdeeree. Well you get the picture. I thought, wouldn't that be funny, to find these words of no particular meaning on "Bread for the Journey". I know what I want to say, but have no words that can accurately express it what I am feeling. 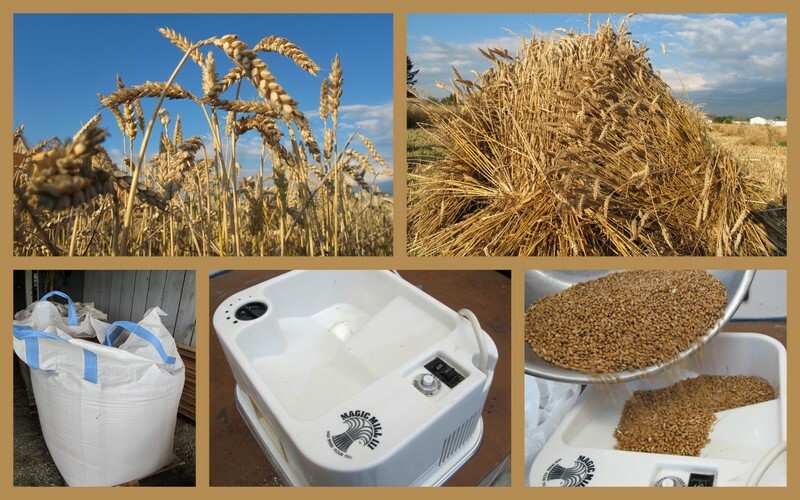 I think of Lovella's post on the Food Grain Bank, and how privileged we are not only having food to eat, but a multitude of choices, and we grumble because we don't know what we want to eat, or complain if something is placed before us that we don't like to eat. There are millions if not billions of people have NOTHING or very little to eat. 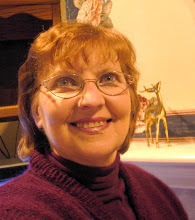 I think of the Good Shepherd Shelter in Ukraine that we are donating our author royalties to, and MCC that helps so many, who are stricken in war, poverty, famine. I browse the internet, and look through my cookbooks for ideas on what to make for supper,the choices are endless. Dare I grumble about all the dirty dishes and clean up that comes with it, when we have had the privilege of preparing food to eat, while others search for tiny morsels found in garbage dumps, or God knows where to feed themselves or their starving children? I ask the Lord for forgiveness of my unsettled spirit and turn my thoughts to gratefulness, and ask my self, (not for the first time either) what is my responsibility as a Christian. Jesus calls us to feed the hungry, help the poor, visit the sick and the lonely. What can I do? I am only one person, but I am one. I can't do every thing, but I can do something and what I can do, I will do by the grace of God. 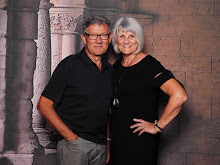 I may not be able to feed all the hungry in the world, but I can create an awareness, here on the blog, in my family when we talk about why I am serving 'beans and rice' today. To be thankful for all that has been given to me, and do my small part in building God's kingdom. For those of you have purchased our book, I thank you from the bottom of my heart for partnering with us, to make a positive difference in this world. This is a simple salad I made for an afternoon on our boat. The flavor combination was one we really enjoyed. you could substitute mango, papaya, canned mandarin oranges or nectarines. 1/4 cup coarsely chopped cashews. Layer all ingredients in order on individual plates and serve. Oh what a treat it was when my parents would come home from grocery shopping and I would see Mom pulling a bag of chocolate puffs out of the cardboard box. Cardboard boxes were often used to carry home the groceries instead of paper bags. And of course these treats were doled out sparingly, oh how I treasured each bite. These chocolate puffs are not even close to perfect in appearance as those bought ones were but they sure taste good. When I cut one to show you what the inside of the cookie looked like, the chocolate shell cracked just like the bought ones did when cut in half. This is a small recipe so no worries about having to store them although I think they would freeze well. 10 ounces semisweet chocolate, chopped, I used good quality chocolate bars, 5 oz of dark chocolate and 5 ounces of milk chocolate. You can use what you prefer. In a medium size bowl whisk together both flours, baking soda, baking powder, salt, and cinnamon. Set aside. Using your mixer, cream butter and sugar until light, beat in egg. Add flour mixture and mix till combined. Drop by spoonfuls on a parchment lined baking sheet. Dip the bottom of a cup in flour and press down the cookies to flatten. Bake in a 350º oven for 9 minutes. 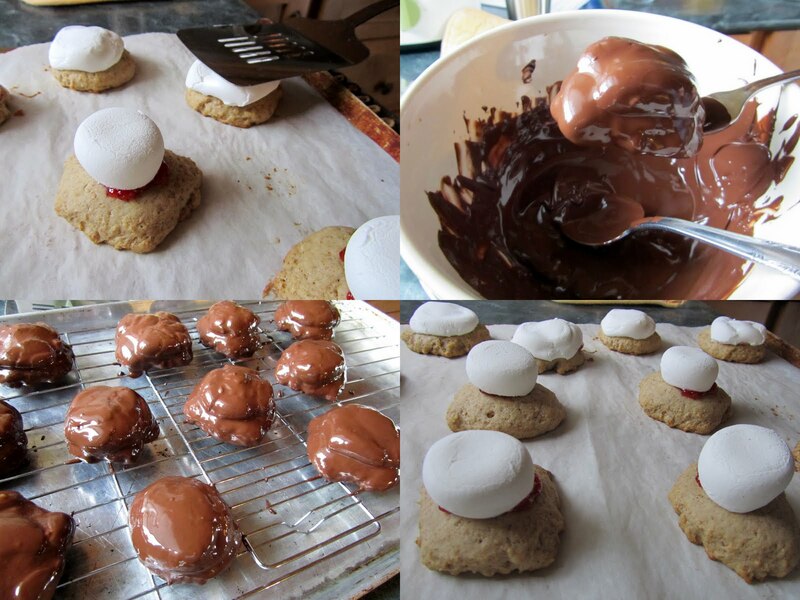 Remove from oven and top each cookie with a dab of strawberry jam and place a marshmallow half on top. Bake another 2 minutes till marshmallows have softened. Remove cookies from oven and using a metal spatula gently press down each marshmallow. For chocolate coating, place chopped up chocolate in a bowl set over a saucepan of hot simmering water. Stir until melted. Place one cookie at a time in the chocolate, using a spoon cover the cookies with chocolate, lift up cookie with a fork and tap on the edge of the bowl to remove excess chocolate. Place cookies on a wire rack set over a baking sheet. Cool cookies in fridge 15 minutes to allow chocolate to harden. served up with fresh baked bread. Why not bake up an apple pie or crisp to finish off the meal. and will have your kids asking for a second bowl. In a large heavy soup pot brown beef. Half way through browning add onions, carrots and parsley. Continue to brown until vegetables are tender. Add broth and potatoes and bring to a boil. Turn down and simmer until potatoes are tender. In microwave or a small pot on stove top melt butter and stir in flour until smooth. Stir this into the hot soup. Cut Velveeta into cubes and add to hot soup along with milk, salt and pepper. Stir over low heat until cheese has all melted. Remove from heat. 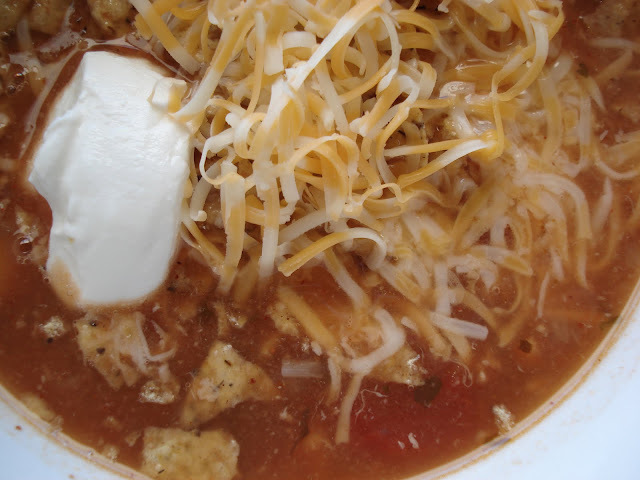 Garnish each bowl with a dollop of sour cream. Soup will scorch easily so make sure you turn your burner to simmer once potatoes are cooked and you begin to add the milk and cheese. This soup can be reheated very slowly. Does not freeze well. Wondering what you, your family or your church can do to remember people suffering from drought and hunger in east Africa? Beans and rice are eaten daily around the world. Here is a simple variation to try at home. Soak the beans overnight in cold water; drain. Heat the beans in about a quart of water, add all ingredients except salt, and boil for at least 2 hours. When beans are tender, mash them up with a tablespoon of oil. All the information you see today and much more can be found on the Canadian Foodgrains Bank Website. Did you know that until September 16/11 the Canadian Government is matching dollar for dollar donations to the famine in Africa? Please go check out this page for more information. Every dollar counts! Early in August I stood in a glass walk way overlooking ground zero. the preparations for the memorial site and the surroundings. . I wondered and tried to imagine . .
the suffering of those that found themselves trapped ..
those that watched in horror . .
the unspeakable grief that so many families were left with. . . .
and those that continue to suffer the effects of being part of the rescue mission. I don't know why God allows such things to happen but I know what the reason isn't. It is not because he doesn't love us. He knows each of us and waits to comfort us. In fact. . .God cares deeply about us and our suffering and became involved when he sent his one and only son to come to earth as a wee baby. As a man, he willingly took all of our sins upon himself and died that we might have life. "For God so loved the world. .
that he gave his one and only son. .
that whoever believes in Him shall not perish but have eternal life". Lord God Almighty, I praise you and and thank you for the gift of your son Jesus. I ask Lord, that you draw near to those that are continuing to suffer in the aftermath of 9/11. In a world where there is so little peace, I ask that you would show your great love and compassion to those that call out to you. Help us to keep our eyes on you. You are the God of the universe and you hold everything together. Please hold us together and keep us from anxiety and panic. Go before us and lead us. Thank you Lord for all the encouragement you send our way and help us to press on when things go bad. Greater is He that is in us than he that is in the world! Help us to remember that we have you in us...the God of the universe. Thank you Lord....we love you and are in awe of your love for us! This savoury bread pudding can be served as an alternative to potatoes or pasta. The flavours of tomato, basil and Parmesan are wonderful together. Butter an oval glass casserole dish (see picture) or a 9x13 inch glass baking pan. Cut bread into cubes and place in dish. In a skillet, heat oil and cook shallots or leeks and garlic for 3-5 minutes over medium heat stirring frequently. Add tomatoes, salt and pepper to taste. Remove skillet from heat and add basil, tossing lightly. Pour tomatoes and shallots over bread cubes in pan. Add 1 cups of Parmesan cheese and toss mixture until ingredients are evenly distributed. Add milk and beat, adding salt and pepper. Pour egg mixture over bread and tomatoes. Stir lightly to be sure all the bread is moistened. Sprinkle remaining 1/2 cup Parmesan over the pudding. 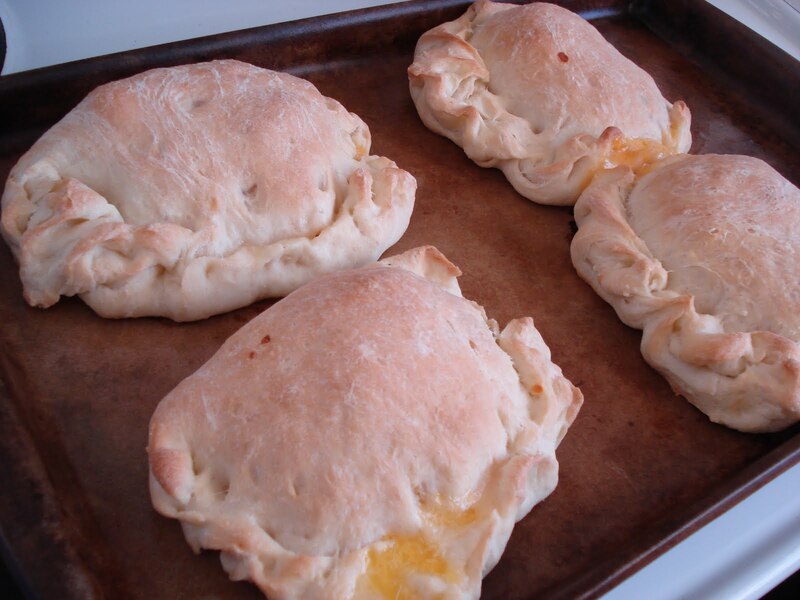 Bake at 375 degrees for about 20-30 minutes or until pudding is puffed and golden. A quick and simple recipe which, for posting, I reconfigured somewhat to allow for the heaping cups and teaspoons I tend to use. Hope you enjoy these as much as we have over the years. Prepare 1 dozen muffin cups by greasing and flouring, or use paper liners. In a bowl or 4 cup measuring cup, stir together dry ingredients. Set aside. In mixing bowl, beat together egg, oil and buttermilk. Add dry ingredients to wet, stirring gently until just mixed. Stir in blueberries and scoop batter into muffin tins. Sprinkle lightly with sugar if desired. The flavours of summer combine to make this salad a great side dish for a BBQ. With sweet local corn and cherry tomatoes fresh from the garden...it's simple and delicious! Preheat the grill to medium. Remove the outer layers of the corn husks and then soak the whole cob in water for about 30 minutes. Peel back remaining husks and remove hair. Brush the kernels with olive oil; then pull husks back over the ear. Place the cobs on the grill and cook for about 15 minutes. Once the cobs have cooled, cut kernels off the cob. Add tomatoes, onion and basil to corn. Combine oil, vinegar, sugar, salt and pepper; mix well. 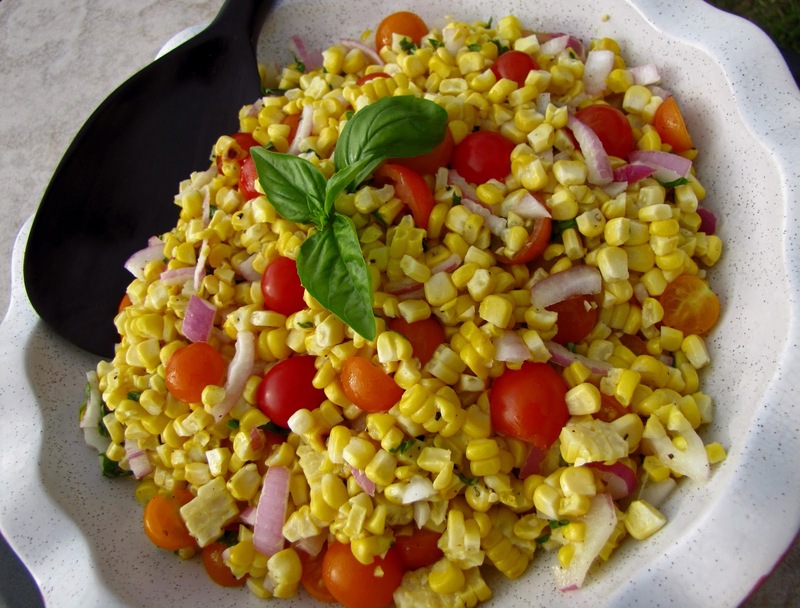 Stir the dressing into the corn salad and enjoy! *The grilled corn gives the salad a nice smoky flavour, but you can also use cobs cooked on the stove top. ***Also. .please enter to win a cookbook on our FACEBOOK DISCUSSION PAGE. Contest ends at midnight on Wednesday. Celebrating three million visitors on our blog this week! Today. ..a contest for one MGCC cookbook giveaway begins on our facebook page on the discussion board. Haven't been to our facebook page? "Like it" today and join the discussions and recipe swaps. and later in the week we'll be providing details here on the blog how you can enter a draw for a second cookbook give away. Spelt flour is gaining popularity for its nutty texture and high protein content. 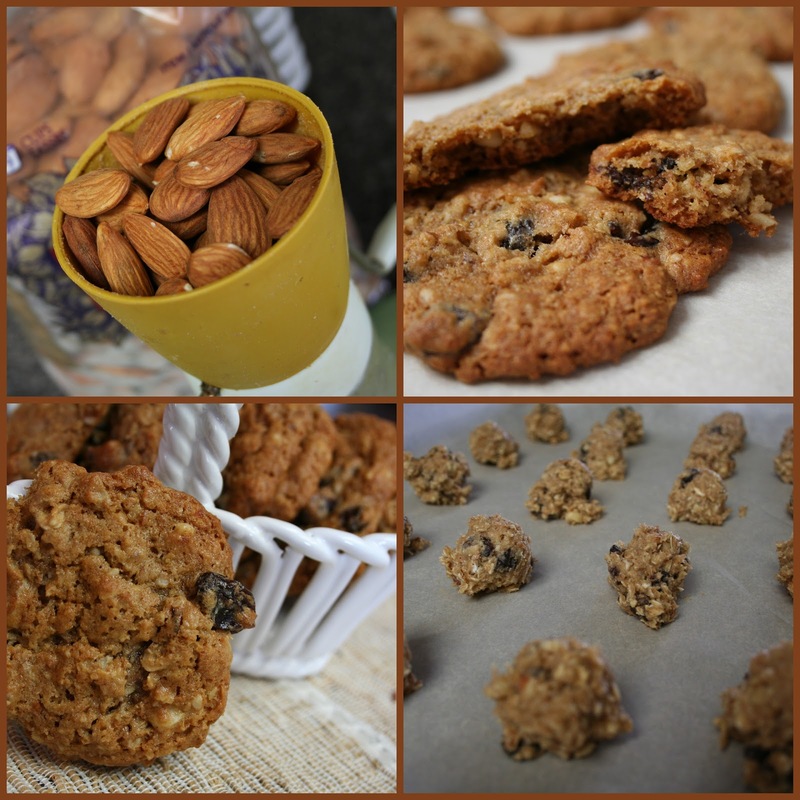 It produces a tender cookie and pairs beautifully with oatmeal and almonds for a great cookie which is great for the freezer and lunch boxes. Cream together the butter, sugars and honey. Add the flour, baking soda, baking powder, salt and oatmeal in the order given. Drop by spoonfuls on parchment lined cookie sheets. Flatten slightly with a fork (the dough will be sticky). – an that is dying. Psalm 48:14 ~For this God is our God forever and ever; he will be our guide even to the end. Psalm 23: 4 ~ Even though I walk through the valley of the shadow of death, I will fear no evil, for you are with me; your rod and your staff, they comfort me. Psalm 73:23-24 ~ Yet I am always with you; you hold me by my right hand. You guide me with your counsel, and afterward you will take me into glory. May we all look to and cling to the Hope that will carry us through to the end. This flan should only be made several hours before it will be served. It takes 1 1/2 hours to bake and then it needs another hour to cool. It's one of those eat the same day you bake it desserts. Simple to make, elegant to serve. Combine flour, sugar, baking powder and zest. Cut in butter until fine crumbs form. Stir in egg until mixture forms a dough. Press into bottom and sides of 7"x11 flan pan with a removable bottom (or a 9" spring form pan. Mix together first 5 ingredients until just combined. Froth the egg white with a fork and paint the bottom of the crust with it. Place the fresh or frozen blackberries over crust. Bake in 325º oven for 1 1/2 hours. Cool. Remove from pan. Slice and serve with whipped cream and more blackberries.